The relative ease with which insurgents have taken control of major cities in Iraq suggests former military officers and others may have joined forces with jihadists to target Prime Minister Nouri al-Maliki's Shiite-led government, Edmund Ghareeb told RT. "What also makes this interesting and what raises a lot of questions about what's going on is that there are many forces fighting under the name of ISIS (the Islamic State of Iraq and the Levant)," said Ghareeb, a professor at American University, adding that the many groups have a common enemy in Maliki. He added that there could be "Iraqi officers, who are from Saddam Hussein's army, who come from the Tikrit area and the Mosul area, and probably that explains [how] military tactics were used, because these were very effective. There was professional planning here." RT:Is it fair to say, as President Barack Obama has said, that Iraq is solely responsible for its own security situation? Edmund Ghareeb: Clearly what's going on in Iraq was a surprise to the [Obama] administration, as I'm sure that, probably, it was a surprise to the Iraqi government as well. The rapidity with which these forces are able to advance and take over a city like Mosul raises a lot of questions about the Iraqi army, which was trained, supposedly, by the United States. They, of course, didn't have very sophisticated weapons in terms of airplanes or missiles. But this is an army where $25 billion was spent to help prepare it for future duties, to help protect Iraq's government, and the population of Iraq. But I think what is happening here is that this all raises questions about the way the US government is looking at this situation, and, of course, the president still has his perception of his own legacy. President Obama, when he was a candidate for the presidency, promised to get out of Iraq. He does not want to return to Iraq. At the same time, this is a complex and difficult situation, and he cannot remain totally out of touch with this situation. That's why we're seeing this response, this careful evaluation of what the US could do or should do. On the other hand, the president has taken into account the political realities on the ground. RT:If the Iraqi army is left to their own devices, can they really defend Iraq from this onslaught? EG: On the one hand, you have an army that has somewhere between 250,000 and 300,000 men. You have security forces that are close to 900,000. So that should be sufficient to protect Baghdad and to protect some of the cities, even against the onslaught of several thousand or hundred, in some cases, fighters. Of course the Islamic state of Iraq and the Levant (ISIS) is experienced, it's composed of many hardened fighters. What also makes this interesting and what raises a lot of questions about what's going on is that there are many forces fighting under the name of ISIS. What we are seeing is that the fighters are fighting under the banner of ISIS, and at the same time, it seems there are other groups. You have the forces of the former vice president of Iraq, Izzat Ibrahim al-Douri, who is of the Naqshbandi, the Sufi order. You have Iraqi officers who are from Saddam Hussein's army, who come from the Tikrit area and the Mosul area, and probably that explains [how] military tactics were used, because these were very effective. There was professional planning here. Also, the Baathists, the former Baathists, may also have been involved, as well as the tribes. These people have a common stand against Prime Minister Maliki. They're all opposed to Maliki. At the same time, I don't think these groups have the same objectives. For example, ISIS wants to have an Islamic caliphate. I don't think this is necessarily shared by some of the Sufi groups, and it wouldn't be shared by the former Iraqi army officers, or the Baath Party. Nevertheless, right now, they may be working together against Maliki. As for the situation also going down in Baghdad, I don't think it will be easy for this force to take over Baghdad, particularly if there is a defense. The demography of Baghdad was changed over the past several years, and it is mostly a Shiite majority city. 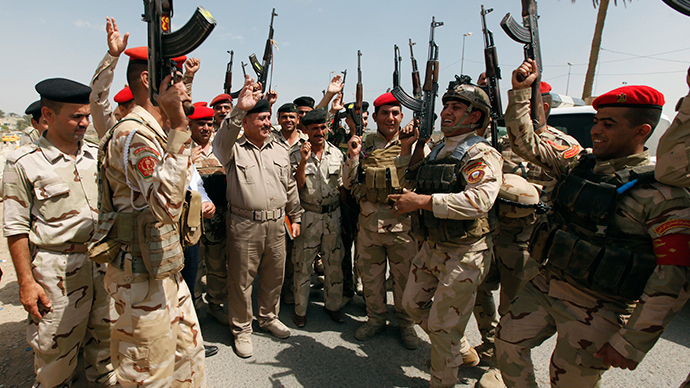 At the same time, there are professional and elite forces which are defending Baghdad, so it won't be easy. Nevertheless, the fact is these forces are moving. They've taken Mosul and, reportedly, Tikrit – though there is a question about parts of it – and Baiji, which is a very important town where you have oil facilities there. They are taking the cities, and that's significant.